Don’t let the cutesy name fool you… the Snuggle-Pedic Ultra-Luxury Bamboo Shredded Memory Foam Pillow means business, and its business is to give you a better night’s sleep. From the very first night you ditch your crummy cotton-stuffed pillow, you’ll instantly feel the difference. You’ll wake up feeling well-rested and you’ll have much more energy throughout the day. 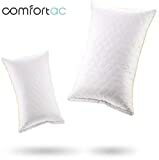 The company is so confident it’ll help you sleep better that it offers a 120-night risk-free trial, so you can return the pillow for a full refund. Despite that insanely good offer, we’d be willing to bet that they don’t get many returns at all.